This handsome, 12-story, limestone-clad, cooperative apartment building is relatively plain for such a prestigious location, but its glory is mostly internal. The building, which is just to the north of Temple Emanu-El, only has 16 apartments. Originally each floor had only one 18-room apartment, but a few were subdivided since its completed in 1920. The apartments have very high ceilings of 11 to13 feet and two huge, equally sized, entertaining rooms that take up the entire Fifth Avenue frontage overlooking Central Park. These rooms were joined by a long gallery along the south side of the building to a large dining room and the rest of the apartment and the gallery in many of the apartments have windows overlooking Temple Emanu-El on the adjacent avenue lot, which was once occupied by the twin houses of Mrs. William Astor and her son, John Jacob Astor. The building, which is also known as 845 Fifth Avenue, was designed by J. E. R. Carpenter, one of the city's most skilled residential architects, for William Henry Barnum. Cross & Cross were associated architects. "Carpenter was the man who set the twenties in motion. He was a Fifth Avenue architect, and he launched the decade with an apartment house that rose up above the Astor mansion at 66th Street like the ultimate challenge," wrote Elizabeth Hawes in her fine book, "New York, New York, How the Apartment House Transformed the Life of the City (1869-1930)," (An Owl Book, Henry Holt and Company, 1993). 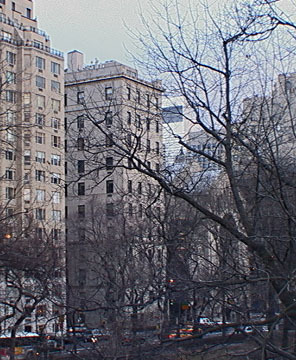 "For one last time, the neighbors, together with the Fifth Avenue Association, the City Club, and the Real Estate Board, responded with old-fashioned alarm, and for one last time, the city responded with restrictive legislation, which reduced the maximum building height on the park blocks between 60th and 96th Street from 150 feet to 75. It was a brief release from the tide of the times. 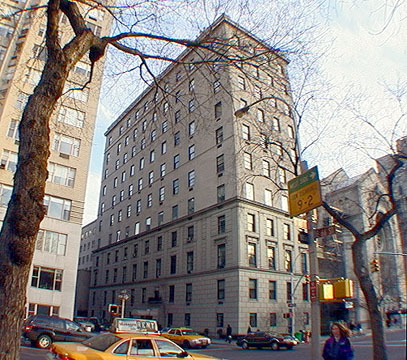 By 1923, Carpenter had brought a successful test case to judgment, which overcame the ruling and opened Fifth Avenue to apartment-house construction. The next year, the Astor place itself fell, and it was suddenly clear that the great family mansion - indeed the family house of any description - was going the way of the farms and shanties of earlier times." Hawes continued. Carpenter designed about a dozen important Fifth Avenue apartment buildings such as 810, 825, 907, 920, 950, 988, 1030, 1060, 1120, 1143, 1148, 1150, 1165 and 1170. Bernard Baruch, the well-known financial advisor, lived on the second floor for many years. The building has a doorman, a concierge and sidewalk landscaping, but no sundeck, no health club, no balconies and no garage. There is considerable traffic in the area.